Abstract: Targeted therapy is commonly used for treating advanced malignant tumors. Compared with cytotoxic drugs, targeted drugs have the characteristics of good curative results, less adverse effects, and convenient oral administration. Hence, they are especially suitable for patients with cancer who are not able to tolerate chemotherapy. Anti-angiogenic therapy can achieve the objective by inhibiting the formation of new blood vessels in tumors. Apatinib is a novel tyrosine kinase inhibitor targeting the intracellular domain of vascular endothelial growth factor receptor-2. It has been proven to be effective and safe in treating patients with gastric carcinoma and gastroesophageal junction carcinoma. So far, no reports are available on the treatment of esophageal cancer with apatinib. Two patients with advanced esophageal cancer were treated with oral apatinib because of their poor physical condition. After treatment, the dyspnea symptoms disappeared and quality of life significantly improved. 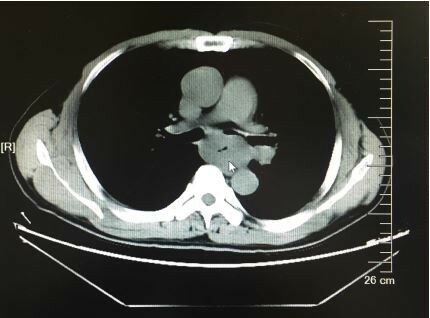 Chest computed tomography showed massive necrosis of tumor tissues in each patient. The tumors significantly reduced and a cavity was formed locally in each patient. However, both patients died of massive hemoptysis, probably due to the rupture of the bronchial artery eroded by tumors. The results indicated that apatinib was effective in treating some patients with advanced esophageal cancer, and adverse effects were controllable. However, doctors should choose appropriate candidates according to apatinib’s indications. In addition, the use of apatinib should be carefully controlled for patients with esophageal cancer, especially in those with large vessels and trachea or bronchus eroded by tumor, so as to avoid or reduce the occurrence of fatal hemorrhage.